Life would be better if everyone could live right next to Nashville's Five Daughters Bakery for their ice cream filled donut or down the street from New York's Carpe Donut and their apple cider donut ice cream sandwich. But that's not how geography works. Thankfully, Baskin Robbins is going to bring a little late-summer joy across the country. 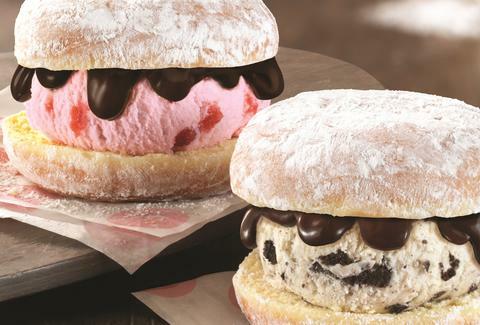 For a limited time, they are serving up donut ice cream sandwiches, made with your choice of Baskin Robbins ice cream, covered with a powdered donut from Dunkin Donuts. Oh, and they cover the ice cream in fudge before slathering it inside the delicious breakfast dessert bread. Mixed in with the 31 flavors you can cram between two donut halves is September's flavor of the month, Pumpkin Cheesecake, because the whole damn world has gone mad and believes fall starts in the summer. Fall starts Sept. 22. No pumpkin-flavored goods until then. No white after Labor Day. And no one should have holiday decorations up before Thanksgiving. Thanks. Nonetheless, ice cream sandwiches are the epitome of everything good about summer, and Baskin Robbins is doing it right with this. Donut ice cream sandwiches launched Sept. 1, so set an alarm because there's a donut involved and you can totally get away with calling this breakfast.